Why so fascinated with bringing back dinosaurs? Size? Curiosity? That they lived before the dawn of humans? Or merely human nature, we want to do something, if we can. Jurassic Park by Michael Crichton is a big, stinky, carnivorous cautionary tale for abuse of technology and he makes no bones about it (yeah, I went for the cheap paleontology joke; sorry, it was the only thing I could dig up). We need more cautionary tales. We find we can manipulate genes, so as humans we think, then we should. Smartphones, Wi-Fi, internet…should, should, should!!! Shouldn’t we find out the consequences first? I’ve heard the argument that God gave us the ability to do these things so we should. b) we also have to ability to kill people, should we? In less than 25 years we’ve become internet junkies. We overshare worldwide. No worries about pulsating signals everywhere. More children plugged in like adorable little zombies. We’re more distracted, obsessed, exhausted, overwhelmed, and less connected than ever…. I began readin g Jurassic Park and Philosophy (edited by Nicholas Michaud and Jessica Watkins) thinking I knew what they’re going to say. To some extent I did; philosophers examining JP in detail, scrutinizing all connotations and consequences as well as providing provocative insights regarding: genetic engineering, cloning, technology, human nature, ethics, religion, drama, humour, and even dinosaurs. Also gave me a creepy ah-ha moment – we’re the dinosaurs, a species striding boldly, masters of the planet, all the while becoming extinct. Yes, another tremendous book in the Popular Culture and Philosophy series from Open Court. I’m so hooked, I can’t wait for the next fix. Hammond, essentially a snake oil salesman, only cared about money, power, and his legacy, he couldn’t see he put his real legacy in danger by bringing his grandchildren to the park to figure out if it was safe, after someone was killed by a cloned dinosaur. Humans are so proud we can do, we forget to show respect for the real power, nature. John Hammond: All major theme parks have delays. When they opened Disneyland in 1956, nothing worked. Ian Malcolm: Yeah, but John, if the Pirates of the Caribbean breaks down, the pirates don’t eat the tourists. 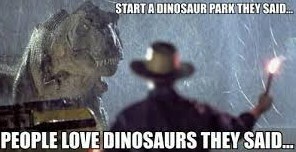 Any thoughts on the reboot of the Jurassic Park series? Jurassic World i s now a state-of-the-art dino theme park on Isla Nublar. 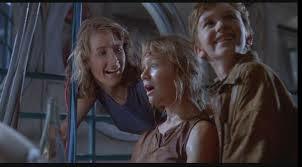 22 years after the events of the original Jurassic Park all is well; what a relief. But wait, frustrated with declining attendance, an exciting new attraction is opened, gee, I wonder what could go wrong? The cast looks interesting, Chris Pratt, Jake Johnson, Vincent D’Onofrio, BD Wong, Irrfan Khan, Judy Greer, Bryce Dallas Howard, but I’ll miss Jeff Goldblum, Laura Dern, and Sam Neill. Written by Colin Trevorrow (also directing) and Derek Connolly, both from Safety Not Guaranteed https://yadadarcyyada.com/?s=safety+not+guaranteed , I’m hopeful this will be action-packed and funny. Also that it’ll continue to offer strong female characters, like Dr. Ellie Sattler (Laura Dern), Lex (Ariana Richards), and well, the dinosaurs were all female, right? Ian Malcolm: God creates dinosaurs. God destroys dinosaurs. God creates man. Man destroys God. Man creates dinosaurs. Ellie Sattler: Dinosaurs eat man … woman inherits the earth. Michael Crichton JP’s author also wrote the book Andromeda Strain which was also made into a fairly successful movie decades earlier. Crichton was quoted as saying “I’m so sick of being known as ‘the man who created the Andromeda Strain’ for so many years…Now I can spend the rest of my life being known as ‘the man who created Jurassic Park. '” BTW Crichton (a M.D.) also created the TV series E.R.. Yes, I always think of Crichton as a great idea guy, but I find his writing a tad dodgy but still enjoyable. I guess a sequel was inevitable considering that studios seem to like them so much. In this case I like that it would be a sequel to project the implications later rather than just redoing the original story in today’s setting. But it seems to me that a premise where people were able to contain the original dinosaurs to the islands isn’t really being true to the original spirit that life can’t be contained that way. Still, I expect I would enjoy it nonetheless. 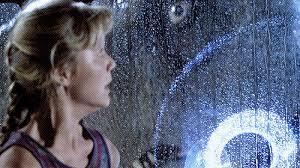 With scientists attempting to clone a mammoth perhaps time to visit Jurassic Park – not just the film but the overwhelming desire by man to NOT leave well alone……. I recently read an article on the science behind JP. It basically said that recreating dinosaurs was impossible because the DNA was too old and would be too deteriorated. It did say, however, that more recently extinct species such as Mammoths and Sabertooth tigers do have viable DNA and could in fact be grown. They are already experimenting successfully with less complex life. Maybe this question is a tad bit off topic (although squarely on the subject of JP), but our family watched this last night streaming on Amazon and there was a scene I swear was in the original but missing. It has to do with the count of the animals in the park. They realize after tweaking their computer program that there are in fact too many animals. I’m not just adding a detail from the book because I never read it ☺. I’m always shocked at the scenes or lines that are removed from movies when I watch them on TV, streamed, whatever. I can see doing that for time years ago, but what’s with that now? Weird. Donna… you’re so dang profound. Really. Thanks for pointing to this old post with your latest. Hugs. And here’s to “women inherit the earth.” 😀 More hugs! Or at least clean it up, once again falling into a traditional role, on a global scale. Sigh.